Blackcomb Helicopters (BH) has been a full-time Whistler business for nearly 30 years. During that time, we have developed a close working relationship with R.M.O.W, Whistler Blackcomb, Whistler Fire Department, Whistler SAR, and BC Forestry Service (BCFS) to provide a multitude of emergency service work. One of those services is our local firefighting ability and response. During High or Extreme fire danger ratings, the BCFS - Coastal Fire Center will hire BH or another local operator on short term contracts to fulfill this need for rapid response. We understand the threat that a passing lightning storm can present to our community, therefore it is essential to have aircraft ready for dispatch and equipped for firefighting should the need arise. Our most recent success story was the fire on Million Dollar ridge on Whistler Mountain in 2016. We dispatched within 5 minutes after receiving the call from Whistler Blackcomb for firefighting support. We successfully doused the fire with multiple AS350 aircraft. The firefighting capabilities we have provided to Whistler are something the whole community can be proud of. It was (and is) accomplished with local employees dedicated to helping their own community when emergencies happen. + Q: I heard you sold your biggest helicopter type. Is this true? A: Yes, we sold our Bell 205 A1 as it was getting older and we wanted to acquire a twin engine medium helicopter. We acquired our first Bell 212 HP/BLR several years ago (we now operate two and soon three), and they currently reside in Whistler. + Q: Are you part of the proposed Whistler FIRST program? A: No, we were never approached to provide support for this program. + Q: Do you agree that Whistler needs a standby helicopter during the summer? A: We believe there needs to be a response plan in place to ensure acceptable reaction times when High and/or Extreme forest danger ratings exist. We already provide this service through BC Forestry and corporately for the community. + Q: I am told that Blackcomb Helicopters is not always available and could be in other provinces. Is this true? A: We do source contracts in other provinces but we always have most of our fleet in the Sea to Sky corridor and specifically Whistler to support our existing clients. + Q: How fast can you respond to a fire? A: On average, our lift off times during High and Extreme conditions are within 5-10 minutes. First drop times depend on location of the fire relative to the water source. Water buckets can pick from extremely small water sources and typically takes only 10 seconds to fill a bucket. + Q: How long does it take to configure an aircraft to be ready for a wildfire response? A: All of our equipment is specially designed to be swapped or applied without the use of any tools. The actual configuration time takes as long as it did for you to read a few of these questions. + Q: I heard that you will be unable to react to an emergency if your helicopter is in maintenance. Is this true? A: Every helicopter requires maintenance. We plan our maintenance during our low season so we do not have to deal with major events in the summer. The advantage we have over most companies is our ability to insert another aircraft should we have a mechanical issue. We typically have 4-7 aircraft in Whistler during the summer months. + Q: What if your aircraft is on another job and something happens? A: If the event is an emergency, we would address the emergency first with our closest helicopter. We have done this countless times with our tours and existing clients. + Q: How much water can you carry? A: Please see refer to our Wildfire Helicopters below. Our Bell 212's will drop 1600 liters or more. Our A-stars can drop 1000 liters each multiplied by the number of helicopters that we can dispatch to the fire. There are normally 4-7 helicopters that live at the Whistler base. I.E. 2 helicopters dropping 1000 liters every circuit = 2000 liters. On the Million Dollar ridge fire, we had 3 A-stars in a circuit dropping 1000 liters every few minutes, which is equal to 3000 liters every circuit! + Q: What is your experience with fighting fires? A: We have up to 25 pilots on our roster; the majority of these pilots have experience fighting fires in BC, the rest of Canada and globally. If you are a helicopter pilot in Canada, no doubt you have fought fires in some capacity. This is normally how the Canadian helicopter business functions in the summer, but more importantly, we have nearly 30 years in Whistler and the Sea to Sky corridor protecting our home. + Q: Can you tell me what helicopter will be available in a time of need. A: We can respond with our best helicopter suited for the job that is available. Typically we would respond with one of our Bell 212's or one of our AS350s. You can see more information on our firefighting aircraft below. + Q: Can Blackcomb Helicopters provide a dedicated Initial attack helicopter in the summer months like the one proposed. A: Yes. We can provide this capability. Should the RMOW consider this model for Whistler, Blackcomb Helicopters would re-assess this idea and propose a more effective, more efficient and more cost-effective model. Since we are local, we can turn this service on and off based on the fire hazard ratings, resulting in a significant cost savings. 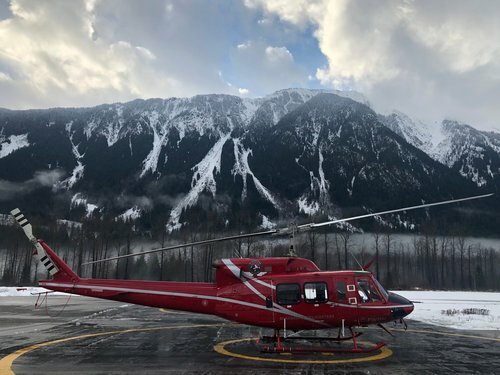 However, if the RMOW is entertaining a dedicated model in Whistler, Blackcomb Helicopters already have the pilots, the aircraft (Bell 212's), the experience and the infrastructure. We encourage people to get all the facts, and be weary of any misinformation surrounding this idea before making their informed decision. Should you have any questions, feel free to call me anytime at our Whistler office.